from our table to yours, below you will find some of our families favorite recipes! ENJOY! Pan frying our Thick Cut Prime filets allows you to lock in the flavor of the steak. 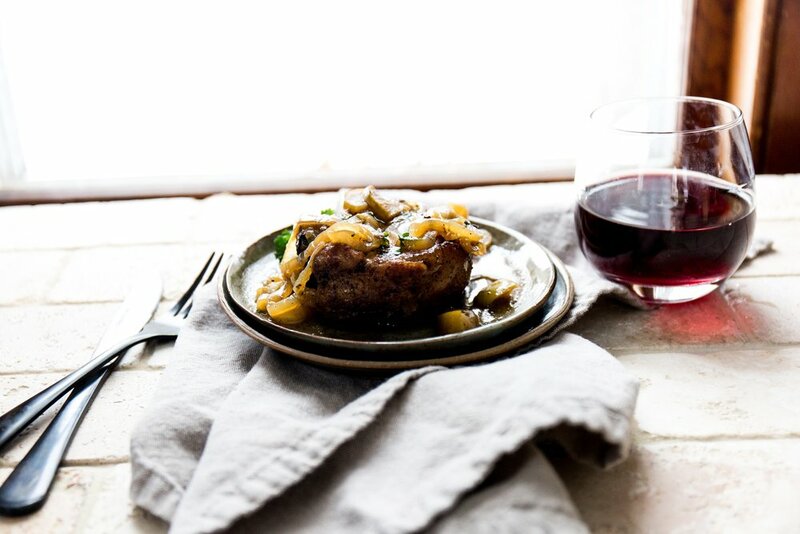 Our red wine reduction and caramelized onions takes the recipe over the top. The original steak Diane, which became popular during the 1940’s, was famously flambéed with brandy tableside. Enjoy our take on this classic dish. Our Ribeye steaks make the perfect Kabobs, this simple recipe used cherry tomatoes, mushrooms, and bell peppers as perfect accompaniment to the steak. 1. Prep the steaks. De-thaw the steaks before cooking. Place them on a paper towel-lined plate and pat dry with more paper towels. This will help dry the surface of the meat, making a better crust. 2. Prepare the rest of the ingredients. Because cooking the steaks will go quickly with almost no hands-off cooking time, make sure you have the rest of the ingredients handy, as well as a probe thermometer and a clean plate for resting the steaks. 3. Season the steaks. Just before cooking, liberally coat the steaks with the salt, making sure to coat the sides of the steaks as well. 4. Heat the pan. Heat a 12-inch cast iron skillet over high heat for about 10 minutes; the pan should smoke just a bit when it is properly heated. 5. Cook the steaks. Carefully place the steaks in the hot pan and cook on the first side until enough of a crust has developed that the steaks no longer stick to the pan, about 1 minute. Flip and cook on the other side for 1 minute. 7. Rest the steaks. Transfer the steaks to the plate to rest for 5 minutes. While the steaks rest, prepare a pan sauce if desired. 8. Cut the steaks. Transfer the steaks to a cutting board and thinly slice across the grain. Serve immediately with the pan juices or pan sauce. 1. Prep the chicken. De-thaw the chicken before cooking. Place them on a paper towel-lined plate and pat dry with more paper towels. This will help dry the surface of the chicken. 2. Season the chicken. Rub the chicken with a olive oil, salt, and pepper or seasoning of choice. Make sure both sides of the chicken are seasoned well. 3. Heat the pan. Heat a skillet over medium high heat, then add 1 tablespoon of olive oil. 4. Cook the chicken. Carefully place the chicken breasts in skillet and cook for 8 minutes. Flip to the other side, cook for another 6 minutes. Continue cooking until internal temperature reaches 165˚F. 7. Rest the chicken. Transfer the chicken to a plate to rest for 5 minutes. 8. Serve the chicken. Serve immediately with any sides. 1. Prep the steak. De-thaw the steaks before cooking. Place them on a paper towel-lined plate and pat dry with more paper towels. This will help dry the surface of the meat, making a better crust. 2. Season the steaks. Just before cooking, liberally coat the steaks with the salt or seasoning of choice. MakE sure to coat the sides of the steaks as well. 4.Heat the grill. Preheat your grill on high. High heat will give your steak a perfect crust. Monitor the grill temperature to ensure that it remains at around 450-500°F. 5. Cook the steaks. Place the steak at the hottest part of the grill, directly above the coals, and let it sear for two to three minutes, then flip the steak and sear the other side for two to three minutes. During the searing process, resist the urge to move the steak around, as this will prevent optimal grill marks. 6. Finish the steaks. After the steak is properly seared, if it’s not finished, move it to the warm side of the grill, close the lid and continue to cook the steak until it’s at your desired temperature for doneness. 7. Rest the steaks. Remove the steak from the grill, place on a cutting board and allow it to rest for five minutes. 8. Cut the steaks. Transfer the steaks to a cutting board and thinly slice across the grain. Serve immediately.